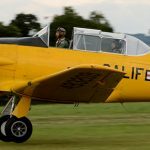 Harvard Flights with goactionstations.co.uk offer an incredibly rare opportunity to have a trial flight in one of these legendary aircraft. You get to take the controls and fly this powerful American classic, used to train RAF pilots during WW2 – no previous flying experience required! The Harvard (Commonwealth name) or North American T-6 Texan (US name) is a single-engined advanced trainer aircraft. It was widely used to train pilots of the United States Army Air Forces (USAAF), United States Navy, Royal Air Force and other air forces of the British Commonwealth during World War II and into the 1970s. Infact, the Harvard is down as the longest-serving RAF aeroplane, used from 1945 and still serving in the 1990s. For our Warbird T6 Harvard Flights we use T6G, G-DDMV. She was originally built in 1943. During 1949 she returned to the factory for upgrading to the T6G standard and re-emerged with the serial 49-3209. After serving with various training units she was delivered to the Haitian Air Force on August 26th 1957 and given the serial 3209. The Haitian Air Force took delivery of 10 T6G, some of which were used as armed aircraft and used to counter incursions from the Dominican Republic by revolutionaries. 3209 was returned to the US during 1982, possibly the only survivor of the Haiti T6s. She was brought to the UK and registered as G-DDMV on 30th April 1989. By 1990 she had been changed into her striking California Air National Guard markings. Aero Legends purchased her in January 2015 and she received a full overhaul, with a new engine fitted. Harvard Flying in some of the UK’s most beautiful, important and evocative locations in the South East of England is an unforgettable gift for a loved one. Enjoy a 20, 30, 45 or 60 minute experience from just £429. A Fly a Harvard experience represents a thrilling, yet affordable flying experience for anyone to enjoy. Family and friends are welcome to attend and see their loved one in the air enjoying the thrill of flying and the aerobatic power delivered by the rasping 600 hp PW radial engine. Get a loved one flying in a Harvard by buying a voucher as a gift and we will deliver an adrenaline filled experience to remember for a lifetime. Our customers fly in a Harvard during the flying season between April and October.